Make your living room cutting-edge and chic with this tailored apartment-size sofa. Loose seat and back cushions are both perfectly tailored and totally comfortable, with plush, down-filled back pillows are the seat cushion of your choice. Further dressing up this casually, stylish look is an exposed wood frame and mod, tapered block legs. The Brooklyn Contemporary Sofa with Exposed Wood Trim by Kincaid Furniture at AHFA in the area. Product availability may vary. Contact us for the most current availability on this product. Fabric Options Over 1,000 designer fabrics available with a complete line of frame styles. Frame Construction Engineered plywood is corner blocked, stapled, and stabilized with mortise and tenon joinery. This construction is guaranteed to prevent warping and provide years of service. Seat Support Springs are double-clipped at each arm to prevent rollover and cross-braced with a double strand of 16 gauge wire. True. Bench-made 8-way hand tied construction available on request. You're hip and fashion forward- you set the trends rather than follow them. You want your home to reflect your vibrant, chic lifestyle, and that's where the Brooklyn collection comes in. This impeccably designed group features tailored, contemporary lines, loose back pillows, and a striking exposed wood base terminating in sharp tapered feet. 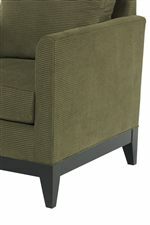 Designed to cater to the modern, urban lifestyle, the sofas and chairs from the Brooklyn collection are smaller-scaled. Customize the fabulous Brooklyn group to make it distinctly you. The Brooklyn collection is a great option if you are looking for Contemporary furniture in the area. Browse other items in the Brooklyn collection from AHFA in the area.